Molds for 3-dimensional precast projects have special challenges you don’t get with GFRC projects. So why would you want to use precast? In this seminar, I explain when you should use precast, what the challenges are, and how to avoid them. I’ll step you through 2 three-dimensional projects I did for my own home, a fireplace hearth and a wall with lighting. 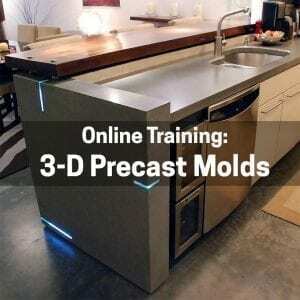 I’ll show you exactly how I made the molds and why I used the precast technique for these projects. You’ll witness the entire process start to finish. Plus, I’ll show you how to make a ramp sink, a great product to have in your bag of tricks for both residential and commercial projects. This seminar will expand your horizons!